Music history is a fascinating subject. Here are some fun facts. 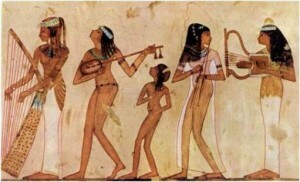 Did you know that some of the instruments we use today originated in the ancient civilizations of Mesopotamia (reed pipes and drums), Sumer (more types of drums and tambourine), Ur (lyres and harps), Chaldea (horns and pipes), Egypt (10- or 12-string harp, vertical flute, single and double clarinets, double oboe, trumpet, lute, lyre, cymbals, and even a hydraulic organ), Hyksos (castanets), Indus Valley (seven-holed flute and various stringed instruments), Asia (double oboe and straight trumpet), Persia and Greece (20-string harp, oboe, bagpipes), and Rome (military brass instruments)? Several of these civilizations also created some form of musical notation, though the art was lost and had to be recreated during the middle ages. The ancient Hebrews had wind, string, trumpet, and percussion instruments, and in some of the Old Testament scrolls, small markings appear above the text of the psalms that have been translated into a system of music notation appearing remarkably similar to the earliest systems of notation used in Christian plainchant. The philosopher and mathematician Pythagoras brought the science of harmonics and the musical scale to Greece from Mesopotamia in the 6th century B.C.E. In fact, it seems likely that the musical legacy of Mesopotamia passed into Egypt, India, Palestine, Greece, Islam, and even China through a variety of cultural sources over the centuries. Ancient China was the first civilization to develop a science of acoustics and placed a high value on accurate tuning of instruments. During the 6th-5th centuries B.C.E., music and dance played a considerable role in presentation of Greek dramas. The dance (orchesis) was performed by the chorus in a special place in front of the stage called orchestra. Italian poets and musicians gave birth to opera in about 1600 A.D. and the term orchestra came into general use for the first time in the sense that we know it today. Of course, this information is barely scratching the surface about the origins and history of classical music! Indeed, there are numerous scholarly works on the subject, as well as many online resources. 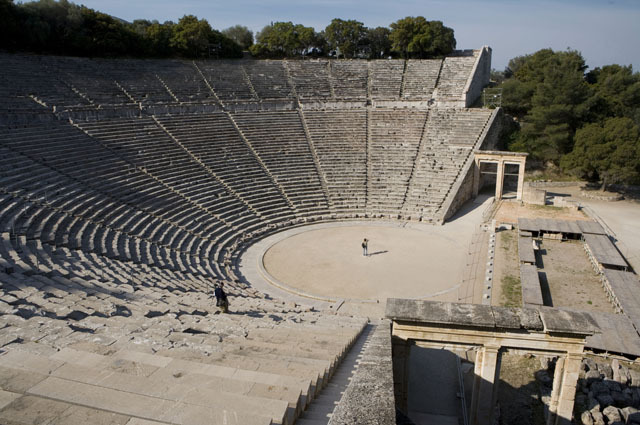 Rather than recreating yet another music history here, we have selected a few sites that can provide you with a good overview of the musical and societal events occurring during the past several millennia that resulted in the forms of music we experience in the present day. Many of the instruments and types of music that were used only a few hundred years ago are quite different than those we use and hear today, so when you come to listen to the Arapahoe Philharmonic, you will generally experience only the pinnacle (so far!) of the classical music form as we perform compositions written for the modern-day orchestra.